Roof repair or replacement is a costly endeavor. Often the financial aspects of installing a new roof or repairing your existing roof are so overwhelming that a healthy roof may seem like an impossible goal. However, you don't have to feel overwhelmed or alone. There are many government grants for roof replacement that could help keep your home sturdy and snug. Listed below are a few government grants for roof replacement or repair. Keep in mind that, depending on the state of your roof, these government grants for roof replacement may not cover the entire cost of your roof repair. Your local qualified roof installer may be able to give you more detailed information on government grants for roof replacement available in your area. Disclaimer: This article is only meant to provide information regarding government programs to which some homeowners may be eligible to apply. HomeAdvancement.com and its partners neither provide nor help to obtain any such benefits and do not guarantee the success of such an application. Eligibility: Low-income families, including families with members who have disabilities, low-income families with children, and senior citizens. One of the main government grants for roof replacement is the Weatherization Assistance Program. This program is run by the Department of Energy and focuses on helping low-income households reduce their heating and cooling costs and improve general health and safety in their homes. Individual states often give priority to senior citizens, families with children, and families where one or more members has a disability. If a member of your household receives Supplemental Insurance Income or Aid to Families with Dependent Children, you are automatically eligible for the Weatherization Assistance, which can provide government grants for roof replacement. Eligibility: Very-low-income families who earn less than 50% of the median income, or low-income individuals who are 62 years or older. Also known as the Section 504 Home Repair Program, the Single Family Housing Repair Loans and Grants program is dispensed by the Department of Agriculture. It provides loans and grants to repair and improve homes that are considered to be safety hazards in very-low-income communities. Loans are available for homeowners who earn less than 50% of the median income. Grants are available for homeowners 62 years of age or older who are struggling to pay their repair loans. Homeowners who are interested in government grants for roof replacement should check out the program's website to see if their home's location qualifies. Eligibility: Tribal members who live on tribal lands. Another of the many government grants for roof replacement is the Tribal Energy Program. According to their website, this program helps tribes "evaluate and develop their renewable energy resources and reduce their energy consumption through efficiency and weatherization." This program also offers education and training opportunities to support clean energy technology, job opportunities, and growth for tribal communities. For more information about this government grant for roof replacement, interested individuals should contact the program's help desk. Eligibility: Very-low-income and low-income organizations, including most state and local governments, tribal communities, and nonprofits. One of the several government grants for roof replacement for organizations is the Housing Preservation Grant. This program provides grants for the repair of low and very-low-income housing in order to maintain livability. Individual homeowners are not eligible for this grant. If you are interested in more information about these government grants for roof replacement, check out the program's website. You can also contact your local rural development office for more details. 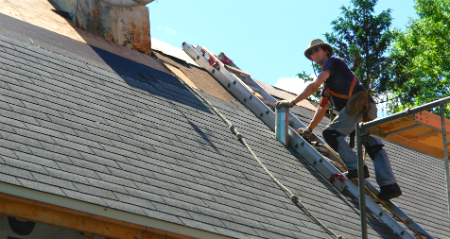 Homeowners who are interested in government grants for roof replacement or repair should also check with their local governments, who often offer community-based programs. You can also contact a contractor in your area to help you research these programs.